In October 1953, Vice President Richard Nixon embarked on a precedent-setting tour of the countries of South and South East Asia. The newly elected republican President, Dwight D. Eisenhower, reinvented the office of the Vice Presidency by elevating it from a nominal and ceremonial position to one of unprecedented responsibility in US foreign policy. Nixon’s core remit was to reinforce, consolidate and expand where possible, the American Cold War sphere of influence in Asia. As part of this tour the Vice President spent three days in Ceylon, an Indian Ocean island state, recently independent from Great Britain. In 1951 Ceylon became the only non communist Asian state to begin shipping strategic materials to the newly communist China. Nixon’s visit to Ceylon, in order to address this (and other issues) personally, became something of a blueprint for US diplomatic operation in South Asia. This landmark visit has never been investigated nor its impact explained. The following article remedies this. Mr Richard Nixon…becomes the first holder of that office to pay a call on this country, and also the first top-ranking American politician of recent times to come here. Hand held firmly outstretched, America’s Vice-President to the newly-in-office Eisenhower, eschewed formal protocol and marched forward in a bid to connect with “Citizen Per-r-ra”. His first connection was with a young boy of 12 years old named Siripala, with whom he swapped pleasantries. 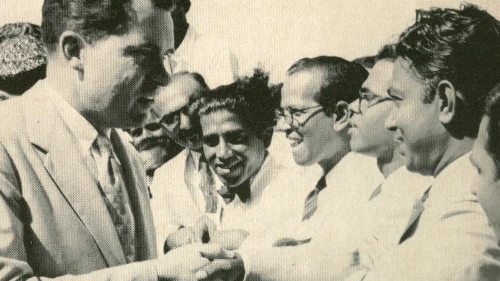 The front page of the Times of Ceylon carried a picture clearly indicative of the tenor of Nixon’s visit to Ceylon: shaking hands through the airport barriers with enthusiastic, if slightly bewildered, locals and asking friendly “how do you dos?”, despite the obvious language barrier. Much to the visible discomfort of Ambassador Crowe, Nixon continued to breach diplomatic convention by agreeing to answer questions from the attendant press corps at the airport. Explaining why he was here, the Vice President broadly summarised the purpose of his historic visit as a unique opportunity to “…bring official greetings from the United States and President Eisenhower and to convey greetings from the Americans to the Ceylonese”. He continued, openly stating that he was willing to discuss any matter with Ceylon’s leadership but that “…he had no instructions to effect any changes in American policy”. As the questions from the press became more challenging, Ambassador Crowe began to look discernibly agitated. When one journalist insisted that Nehru of India had claimed evidence that the US and Pakistan were involved in negotiations regarding a military pact, Crowe decided that he had heard enough. Nixon was abruptly interrupted and, still smiling, whisked away to his home for the night, room number 24 in Sir John Kotelawala’s Prime Ministerial residence, Temple Trees. And so began a three day diplomatic tour of Ceylon by the Vice President of the United States and his wife. A tour unprecedented in Ceylonese as well as US Vice Presidential history, and one largely, if not wholly, forgotten or ignored by historians and Nixon’s biographers. The details of Nixon’s visit to Ceylon upon which this article, both the narrative ‘story’ and the critical analysis, is based were sourced from a number of locations. There are three main resources utilised: Firstly, the Richard Nixon Pre-Presidential Collection located at the Richard Nixon Presidential Library and Museum at Yorba Linda, California. The documents examined from the library, including recently declassified memoranda, personal messages and policy papers, most of which are readily available for research, were a valuable insight into the activities of the Nixons in Ceylon – their personal feelings and thoughts as well as their public engagements and private diplomatic meetings. Many of these documents illuminate the careful planning and sometimes bold orchestration and application of US policy in post-independence Ceylon. Secondly, much of the ‘story’ is recreated with the help of a number of Ceylon’s newspapers which provide a context for the trip, detailed coverage of the visit itself and, perhaps most importantly, a barometer of local political and public reaction to the visit. Thirdly, the article relies upon contemporary issues of the New York Times to provide the necessary US perspective on both the Cold War priorities of the Eisenhower administration and Ceylon’s position in relation to them. All of the sources used here are accessible to those wishing to explore them. The visit to Ceylon is a crucial part of America’s early Cold War foreign policy agenda, adding important insight into the emphasis Eisenhower placed on the role Asia was to play in the wider Cold War. In addition, this research is significant not simply because it is original, but because it contributes value and substance to Richard Nixon’s biography. No man in this country can go to another, and particularly to a new one, and spend a few days there gathering impressions, seeing the people, without benefiting himself for better service to his own country. The demands of the Cold War and, in particular, the spreading of its battlefields to the countries of Asia, meant that the American foreign policy network needed a new system of management – a management that would incorporate Asian geo-political subtleties into its rather doctrinaire Cold War, ‘Europe First’, policy complex. Eisenhower (and indeed Washington) was relatively unfamiliar with the dynamics of the individual countries of Asia – many of which were undergoing a process of identity building following the transition from colony to sovereign state – and so Nixon “…was being asked to fill a gap in American foreign policy. He seized his chance”. The “gap” which, post-haste, needed to be filled, was a perceptual gap as much as it was a practical geo-political gap. Many of the countries of post-war South and South East Asia, ripe with irredentist, nationalist and various post-colonial movements, either viewed the United States with suspicion – as a modern variant of the pre-war coloniser -, or as was more often the case, as one of the two ideological Cold War centres, to be resisted or embraced dependent upon the political hue of the governments in place. It therefore became of paramount importance – recognised by Eisenhower and Nixon – that America move quickly to assuage the suspicion of the countries of South and South East Asia vis-à-vis colonisation and/or win their ‘ideological’ trust. The problem, however, was that the American Cold War foreign policy strategy was centred in Europe. Consequently, there were significant deficiencies in the diplomatic relationships America conducted with many of the countries of South and South East Asia – deficiencies which were rapidly becoming dangerous to the security of the United States now that this region had so recently become part of the Cold War. Enter Vice President Richard Nixon. Nixon has now come East for the first time, but he is the representative of a Party whose political program at the last presidential election promised great things for Asia and severely criticised the ‘Asia last’ policy of the Democrats. In his first term as Vice President, Nixon visited thirty two countries, fifteen of which were in Asia, three in the ‘near East’ and two – Australia and New Zealand – who see South and South East Asia as part of their regional locale. In short, the ‘gaps’ and deficiencies in the American Asia policy were being filled and remedied. What is unusual, however, is that despite the heavy emphasis placed upon the re-imagining of America’s role in Asia – so important that Nixon’s ‘Far East Trip’ has now seemingly entered the realms of folklore and become part of the lexicon of early Cold War language – his diplomatic expedition to Ceylon has been almost entirely ignored, entirely forgotten about. Ceylon, to all intents and purposes, has been erased by under-investigation from the US map of early Cold War Asia. In the post-war historical record it remains a serious ‘gap’. Governor Dewey, Adlai Stevenson and John Foster Dulles were among those who recently toured the East, but for some inexplicable reason all of them bypassed Ceylon. Secretary of State Acheson, during the time that he served in office, made 16 trips to Europe. He never made any trips at all to Asia. As a result, the Asians, who already were somewhat sensitive, had a tendency to feel that they were being overlooked, that their importance was not as great in the minds of the leaders of the United States as that of the people in Europe. Even after Nixon’s celebrated ‘Far East Trip’, to which entire chapters have been dedicated in related biographies and Cold War histories, there is little if any discussion of Ceylon. Perhaps more significantly, in his very own memoirs, there is no mention of the three days he spent in Ceylon in November 1953. Nixon’s arrival in Ceylon on the 27th was set against the backdrop of a world visibly adjusting to the demands placed upon it by the maturing Cold War. At home the United States was cowering under the glare of Joseph McCarthy. In fact, on the 26th November, the day before Nixon’s arrival in Ceylon, McCarthy was upping the ante by attacking the White House administration of President Eisenhower. After the ‘fall’ of China, and spurred on by the ‘domino theory’, the US, as part of a UN based coalition of forces, had gone to the assistance of Syngman Rhee’s South Korea – the endgame of which was being cautiously and publicly played out by Arthur H. Dean (special U.S. Ambassador in the Korean Negotiations), South Korea, Communist China, and North Korea. America had begun the process of re-building Japan prior to the Korean War but was now, partly as a result of the war, taking contentious steps towards returning the political, social and economic administration of the country back to the Japanese. American Cold War policy required a politically stable, economically liberal and, more controversial, militarily reconstituted Japan. Importantly it required a Japan whose population would stand behind a government explicitly tied to a country that had partially destroyed it during World War Two. An overt American management and direct rule was thus necessarily replaced by an autochthonous Japanese government managed only by a ‘distant’ American paternalism. In Indochina, French colonisation was in its death throes and in less than a year would be buried in the ground at Dien Bien Phu. The United States, horrified at the idea of another Asian country succumbing to communism, was already paying 80% of the French bill in Vietnam and was formulating plans to manage the inevitable French defeat. In South Asia, the newly independent countries of Pakistan (East and West) and India were involved in post partition antagonisms (over Kashmir) which had, already in 1947, exploded into full-scale war; antagonisms which remained, long after this early conflagration had ended, as a constant a reminder of how fragile stability in the region could be. In February 1948, the year following the independence of India and Pakistan, Ceylon transitioned with relative ease from a crown colony of the British Empire to an independent dominion within the British Commonwealth. Her first Prime Minister was the eminent Don Stephen Senanayake. He led the United National Party (henceforth referred to as the UNP) to electoral victory in the 1947 parliamentary general election. In a declassified document outlining the “Symbolic Acts” Vice President Nixon should carry out during his visit to Ceylon, D.S. Senanayake is refereed to as the “George Washington of Ceylon”. Upon his death from a horse riding accident in March 1952 his son, Dudley Senanayake was appointed Prime Minister. In 1953, the year of Nixon’s arrival, Senanayake, who had overseen a noticeable decline in popularity of the UNP, resigned and was replaced by his cousin, Sir John Kotelawala. The political party that these three men led – the UNP – was one which identified clearly with the central tenets of American socio-economic liberalism. Politically this model was protected by the business owning, wealthier classes within the Ceylonese polity who had clear interests in ensuring continued UNP governance. However, in the early 1950’s, Ceylon was in a state of economic uncertainty and ideological flux – a dangerous combination that was clearly counter to America’s tentative new Asia policy. …that the one-day hartal last Wednesday was the beginning of a struggle to “liberate Ceylon from the imperialists and their United National Party stooges” . …we find tangible expression of our belief that the safety and self interest of this nation are inextricably tied in with the security and well-being of other free nations. …a period of intensive policy re-examination and forward planning, of operational overhaul and streamlining, and of encouraging progress in free world defence and development. The hartal to which the earlier Times article was referring was brought about, in part, because of rising food prices and the government removal of subsidies on certain staples. Sponsored to a degree by socialist hardliners and exploited by leftist politicians, the situation in Ceylon became such that a state of emergency, with consonant curfew restrictions, was declared by the government in the Southern and Western provinces. In just two days of August 1953 twenty one people were killed, one hundred and seventy five hospitalised, forty policemen injured and three hundred and eighty arrested. In a declassified ‘Pocket Summary’ of Ceylon, given to Vice President Nixon’s Executive Assistant, Christian Herter, there are clear concerns shown for the leftist organised civil disturbances and the loss of popularity suffered by the UNP under the “…indecisive leadership of Dudley Senanayake”. The strikes in Ceylon were only a small part of a larger, occasionally violent, undercurrent of discontent washing over the island. Sir Cecil Syers, the UK High Commissioner in Ceylon at the time, expressed with concern that he was only “…restrainedly optimistic” that Ceylon could weather the storm without some grave consequence to the stability of the island. Ceylon’s ability to ‘weather’ the “…economic storm” was highly contingent upon a number of factors, not least of which was its ability to provide economic stability and social satisfaction to those looking for alternative political and economic models within government. Eisenhower’s concern that the ‘…safety and self interest’ of the United States was ‘…inextricably tied in with the security and well-being of other free nations’ in addition to his unwavering belief that an unstable Asian country was a domino waiting to fall, is exactly why Ceylon in the early 1950’s was a country deserving of a three day visit from the Vice President. Despite the ideological coloration of the UNP and its early leaders, economic realities in Ceylon had forced her into a trade pact with newly Communist China that allowed her to compensate for the shortfall in domestically produced rice by exporting rubber to China in exchange for the foodstuff. Rather counter intuitively, for a tropical country ideally suited to paddy cultivation and whose population depends almost exclusively upon rice as its basic food staple, Ceylon has, in modern times had to depend upon securing access to external rice markets for its sustenance. The instability caused by the nationalist struggle against the French in Indochina coupled with Kim Il Sung’s invasion of South Korea, caused a stranglehold upon some of Ceylon’s key providers of affordable rice. To raise revenue for the purchase of its rice, Ceylon relied heavily upon certain key revenue generating exports such as rubber. Thus it was that Ceylon, heavily sympathetic to the United States and faced with formidable leftist enemies from the opposition benches, entered into a rice-rubber agreement with an avowed enemy of Washington and a close ideologically relative of those in opposition wishing to get into power. A Ceylon government spokesman said today in reference to the statement made by Mr Harriman, the retiring Director of Mutual Security, expressing concern at the sale of Ceylon rubber to China, that Ceylon had achieved two important benefits from the China agreement. It had helped to stabilize the Ceylon rubber industry at a critical time when low prices were throwing large numbers out of employment, and it allayed anxieties over the food situation. The Ceylon Government regards these two achievements as formidable weapons in stemming the tide of Communist Opposition from exploiting the country’s economic difficulties. The alternative to the present Government would be a Communist administration. Nothing would hasten the arrival of such an administration more than a lack of food, disorganized Government finances, and mass unemployment. The issue between us and the…Chinese Communists – slavery or freedom – is fundamental. There is no formula that can either hide it or solve it. We are fighting to free the minds and souls of men from communism, and we in the free world must stand together in this great fight. It is not a fight of Left against Right – it is a fight for the human dignity of man as a creature of God against the Communist doctrine that he has no value except as the state desires to use him. An island about the size of West Virginia, Ceylon is strategically situated on the great trade route between the Middle East and the Far East. She has a Government veering to the left of center, a rising birth rate and a declining economy. Unemployment has increased 31 per cent, to 116,000, in a year. Export trade for the first quarter of 1958 was down by 11 per cent, a favourable trade balance is beginning to wane and external assets are declining. This correspondent found in Colombo and elsewhere in Ceylon that the economic decline had been caused in part by political trends. In many respects what is happening in Ceylon typifies the economic and diplomatic conflict throughout free Asia between the United States and its allies and the Soviet Union, Communist China and their allies. The impact of United States and other Western aid programs on Ceylon’s faltering economy may prove a decisive factor in the coming struggle to hold the island nation within the West’s sphere of influence. Thus Ceylon’s importance to the US in real terms and as a ‘test case’ in American activity in South/South East Asian states, was significant. Washington’s view of Ceylon’s activities was ideologically narrow and obscured by distance. Ceylon was included on Nixon’s itinerary because the issues were important enough that immediate, first-hand, clarity was deemed necessary. In many ways Ceylon was a case study of the issues pertinent to all emerging Asian nations who were being forced to operate in an unfamiliar Cold War paradigm but at the same time having to reshape their countries, politically, socially and economically, in their own image. As a newly independent state, it was for the first time in hundreds of years, responsible for its own course. For the first time, masses of people, previously excluded from the management of their country, were being mobilised around ideas and ideals, via a political process, towards the forming of their own country. The people of Ceylon, and by and large the peoples of Asia, in the infancy of political experience and hungry for solutions that would provide a greater degree of equity in both wealth and opportunity, began to put pressure on its leadership to address their concerns. Politicians, for their part, were happy to oblige. Thus, in opposition, the SLFP began to offer solutions to the problems of the excluded, coloured with, amongst other things, nationalism, religion, socialism and no small amount of anti-Americanism. Such themes were familiar to, and recurrent in, many other Asian nations recently ‘unshackled’ from colonialism, as well as those contemporaneously attempting – through force – to join them in their independence. Consequently, the forces shaping the very political and economic contours of early Ceylon, and the patent battle being waged by parties from the left and the right for the heart of the electorate, provides an exemplar of just why Eisenhower sent Nixon to Asia. Ceylon, in many respects, presented a microcosm of the ideological uncertainty that was seizing much of Asia. If Eisenhower wished to draw Asian states into America’s sphere of influence to form a crucial, containing, barrier against the spreading tide of communism, then the United States would have to develop real and meaningful relationships with all of the countries of Asia. A new effort must be made, Nixon believed, to counter the “…vicious smear of America and Americans…being spread by the Communists all over the world”. Eisenhower’s “…serious concern that the United States was ignoring the emerging nations of Asia” itself presents a statement of intent – no Asian country was to be ignored. In the Cold War world, such an oversight would prove too dangerous. This is why Nixon was sent to Asia – so that the free nations could “…get(ting) their message across”. This is why he was sent to Ceylon. This is why his visit to Ceylon is a tragic omission from the canon of work on Nixon’s contribution to US foreign policy. With this background, Mr Nixon will be able to influence United States foreign policy as has perhaps no other Vice President. New York Times correspondents in the capitals he has visited, who were asked to dispatch reports evaluating the tour, indicated he was likely, in particular, to use his influence to bring about the rearmament of Japan; to overcome delays in the reconstruction of South Korea; to bolster the French and the three native governments in their war with the Communists in Indo-China; and to complete an agreement providing Pakistan with arms and the United States with bases there. …for the purpose of letting the peoples of Asia understand that the United States was interested in their problems and their aspirations in the same way as other people: listening to their views and gathering facts about existing conditions to be reported to the President for guidance and benefit in reaching policy decisions. This is exactly why he went to, and what he did in, Ceylon. It is certainly noteworthy to point out the different emphases placed upon the visit by the two newspapers. The New York Times discusses the practical American policy perspective of Nixon’s trip, whilst the Ceylon Daily News paraphrases Nixon’s more ‘Asia friendly’ justification for coming to Asia. The reasons for the two contrasting approaches are obvious. Unfortunately, the substantive details of his visit are reported in no journal and mentioned in no biography. It is perhaps understandable that, given the breadth and scope of Nixon’s ‘Far East Trip’, certain parts of it be under – reported or de-emphasised relative to the more immediate and high profile US concerns in Asia. In Korea battles had been fought, soldiers had died and the future of the country lay in the immediate balance. In Japan a new, democratic country was being reformed with profound strategic and economic consequences for the US. In Indochina, the French, on their last legs, looked certain to withdraw and leave a vacuum to be filled, if allowed, by the Vietnminh, ‘proving’ beyond a doubt to nervous US observers the veracity of the domino theory. The rubber and tin of Malaya, Indonesia and Ceylon, in the event of an attempted world conquest, either military or economic, could be decisive. V.P. Nixon could begin the unprecedented process of embedding South Asia into America’s geo-political security complex – and this process could begin in Ceylon. With its pro-western government fighting something of a rear guard action against socialist forces, and because the country continued to exist under the maternal gaze of the British Commonwealth Office, Ceylon represented a relatively easy toe-hold for the US in the region. It would take only a little effort for the two countries to become closer partners. In a sense, Nixon could have begun in Ceylon a pre-emptive reverse domino effect for South Asia. The six hundred million people living outside of the Communist dominated areas of South and South East Asia were the key to US Cold War hegemony in the region. These people were to be won or lost depending upon their inclusion in a new and more subtle American regional policy which would incorporate the nuances of local social, economic, religious, cultural and political interests. Such was the importance of winning “…the minds and hearts and souls of men in Asia”, that Nixon himself believed “…these six hundred million people hold the balance of power in the world today”. Ceylon represented an ideal opportunity to begin tipping the balance in South Asia, towards America and the West. In short, Ceylon was important to the United States in 1953. Unfortunately, this importance has been largely forgotten in history. The only major obstacle to the burgeoning of such a relationship (as seen in 1953) was Ceylon’s dealings with Communist China. Though borne out of economic realities not ideological intimacy, the island’s new relationship with China forced the United States into prioritising closer relations with the island as an immediate concern. The Rice -Rubber agreement was, after all, the only agreement of its kind in South and South East Asia at this time. Thus Nixon’s primary task when he arrived was to re-iterate Washington’s dissatisfaction with the relationship, obtain assurances that Ceylon remained firmly committed to a democratic, ‘free’ future, whilst at the same time solidifying the bi-lateral connection between America and Ceylon by conveying a firm, but contingent, friendliness and demonstrating a determined commitment to the economic and social progress of the country. Nixon, and indeed his wife, were deftly able to accomplish these tasks with a mix of gregarious informality (shaking hands with, and offering friendship to, socialist protestors), local politicking (connecting with ‘Citizen Per-r-ra’), and frank discussion (publicly describing the Rice -Rubber Agreement as a “…point of irritation”). When Vice President Nixon and his wife Pat arrived in Ceylon on the 27th November, they had already visited fifteen countries and stayed in nineteen major cities across Asia and Australasia in just over 50 days. In keeping with the tenor of the rest of the trip, their time in Ceylon was to be as busy and concise. In their forty three and a half hours on the island Vice President Nixon undertook fifteen separate official engagements and his wife, when not in attendance with her husband, was involved in her own very busy schedule. …it was evident that Ceylon had entered into the rubber-rice pact with communist China, purely for economic reasons…the misunderstanding over this pact, and the attitude of the free world concerning it, should be cleared. …Ceylon had no sympathy for Communist regimes – either the Soviet Union or China, and it was a completely wrong appraisal of the situation for anybody to think otherwise. …had no doubt the Government of Ceylon and the great majority of the people were firmly aligned on the side of the free nations. At roughly the same time as Nixon was giving his affirming departure speech at Ratmalana, Prime Minister Kotelawala was delivering a boldly anti-communist speech at Devituraippitiya to an enthusiastic (and of course partisan) crowd, in which he stated that, “The threat of Communism can easily be overcome by the co-operative effort of all”. In a personal letter to Nixon just over a month later, Kotelawala expressed his gratitude to the Vice President for the understanding he expressed, publicly and privately, during his visit, of “…our problems”. One can’t help but imagine that the speech at Devituraippitiya was Sir John’s parting gift to Vice President Nixon. Pat Nixon, for her part, spent the majority of her time (that not spent with her husband) endearing herself to both the local Ceylonese and those with whom she had official engagements. Whilst Vice President Nixon dealt with the issues pertinent to the high level functioning of the bi-lateral relationship, Pat undertook the valuable responsibility of connecting the two countries on a more human level. One of the primary objectives set for Nixon by Eisenhower was to fathom an understanding of the hopes and desires of the ordinary citizens of Asia and to convey to the people of the region a positive, respectful and benevolent image of the United States. Of course these themes would be implicit in all the Vice President did and said, however, the inherent limits placed on Nixon by his schedule and his many other duties meant that Pat Nixon was given the de facto role of Cultural Ambassador – an unprecedented responsibility for the wife of a Vice President. Mrs Nixon dedicated her available time to visiting orphanages, hospitals and homes for the aged. Such was her impact that her visits often overwhelmed those that she was visiting. Despite the obvious language barrier she was able to convey a sense of empathy and involvement that did incalculable good in overcoming the somewhat typical Asian image of Americans as domineering, self-interested imperialists – the image Eisenhower and Nixon were consciously attempting to subvert by this trip. In a hand written note scribbled in the margin of the weekend’s itinerary, Pat Nixon revealed her surprise at being greeted so warmly and enthusiastically by staff and patients at a home for the aged – she simply wrote that the “old people were thrilled”, pointing out that nobody, until she arrived, had ever visited them. Accompanying Mrs Nixon on a number of her visits was Mrs Irene de Silva (wife of C.C. de Silva). Mrs Silva was no less impressed. In a hand written letter to Mrs Nixon she sums up the dual impact the Vice-President’s wife had during her brief stay in Ceylon. After one of their visits to a hospital, Mrs de Silva wrote that Pat had given “…herself in a real spirit of love and service”, going on to wax poetic that “…this journey can ‘build bridges from man to man the whole wide world to span'”. In one brief letter we have the crux of the visit – to demonstrate the humanity of American policy abroad and to forge alliances via the similarities to be found between Americans and those people in the world wishing to remain ‘free’. Whenever you are with me look for opportunities for me to break away from the protocol people and greet ordinary people who may be standing along the side. For example, children, cripples, old people, etc. Secret Service men and anyone else who is with us at receptions should assume the responsibility of being sure that no photographers are snapping shots when I have a drink in my hand. The United States Information Agency (the practical/propaganda arm of US foreign policy) was already heavily involved in Ceylon prior to the visit of the Vice President. In fact the activities of the USIA increased noticeably after the Rice – Rubber Agreement was inked to the extent that, according to declassified Confidential Security Information, it covertly supplied anti-communist material used by the Government party, the UNP, in the critical 1952 election. Additionally, the USIA, under the stewardship of Argus J. Tressider, assisted in the dissemination of material relating to Communist China’s anti-Buddhist attitudes. America’s powerful Voice of America antennae was located in Ceylon and, with the agreement of the government, proceeded to pump out pro American broadcasts to all of South Asia. In this sense, Ceylon was crucial to American efforts in projecting its national interest into the region and thus the country needed closer monitoring by a high level government official – Vice President Nixon. But Nixon’s Asian tour was no mere play of symbols and imagery. Nixon came to the region to examine the subtleties of Asian private and political life, reinforce alliances and forge new ones, address concrete issues vital to the national security of the United States, and, where possible, solve diplomatic problems. This was his remit for the region. This was his remit for Ceylon. What he was able to accomplish (with the help of his wife) on his visit to Ceylon, perhaps more so than in many of the other countries on his itinerary, was to successfully combine the three central objectives of his mission into one almost seamless tour de force: 1) To address the concrete concerns Washington had with regard to the country’s Cold War alignment – specifically Ceylon’s relationship with Communist China, 2) To gather primary evidence relating to the issues and concerns of ordinary citizens and, 3) To present an image of the United States as benevolent, altruistic and powerful. The first objective was accomplished via his amicable and productive meetings with Prime Minister Sir John Kotelawala. The diplomatic warmth re-ignited by Nixon and Kotelawala after the cold uncertainty felt due to the Rice-Rubber Agreement was palpable. This warmth was amply demonstrated once more when, just over a year later, the Ceylonese Prime Minister visited Washington, during which time the two men once again cordially reassured the other of their commitment to the bi-lateral bond. The second objective was achieved by a mixture of formal discussions with politicians, educational and labour leaders, informal and often spontaneous dialogues with locals, as well as the invaluable community work done by Pat Nixon. At one point just after lunch on the Saturday of their visit, the Nixons made an impromptu stop along High Level Road on a drive from Temple Trees. Pat Nixon’s handwritten remarks reveal that they stopped to take in the local fish and meat market and, more revealing still, the local Communist Centre, describing the people they encountered there as “friendly”. One of the key and recurring motifs of Vice President Nixon’s Far East tour was that he was willing to walk, with a warm smile and an outstretched hand, straight up to those who were in attendance specifically to oppose his presence. Nixon instructed those charged with organising his trip that he wanted to “…talk to as many controversial people as possible. The natural tendency is usually to discourage them but I want to see them all if possible. I want to hear what they have to say and let them feel they can get in”. The fact that Nixon met such people by design rather than spontaneously reveals the extent to which the new Eisenhower administration viewed the Asian region as vital to American interest – they were prepared to risk public humiliation in order to project a gregarious, benevolent and welcoming image. It was the impact of such actions that was important. Nixon’s disarming manner coupled to his wife’s community involvement often brought winning results. There has been some speculation, however, as to whether the Vice President’s tour has other purposes… He leaves for India and Pakistan from Ceylon, and he comes to this country at a time when Pakistan’s neighbours are beginning to be concerned about reports (since denied by Pakistan) of negotiations for a defence agreement between Pakistan and America. Behind the smokescreen of the anti-communist phraseology, this simply means that Nixon’s mission is to find out how much American interference in their internal affairs Asian Governments will stand. Such diehard views as expressed by organisations of this ilk Nixon clearly would not be able to change, nevertheless, what Nixon was able to do via his actions in Ceylon was, in essence, to assuage the doubts of those holding political power. He was largely able to assure them of America’s support (contingent of course upon continued non-alignment with the communists), whilst simultaneously managing the cries of ‘foul play’ by his local opponents. It would appear that in Ceylon, Vice President Nixon found an ally for the United States in South Asia. The foundations that Nixon and Kotelawala laid in that brief period of time in the balmy tropical November of 1953 can be seen quantitatively reflected in the rapid rise of economic aid and assistance granted by the United States to Ceylon from zero in 1953 to a total of $20.6 million by 1958. Unfortunately, as the consequences of the socialist SLFP coalition victory of 1956, engineered by SWRD Bandaranaike, became apparent, much of the amicability between the two countries began to dissipate. Nixon’s visit to Ceylon should provide a singular case study in early Cold War US – Asiatic bilateral relations and the benefit to be found in the new paradigm shift towards a more direct and immediate approach to American diplomacy in the region. Instead the significance of the visit has been lost in the shadows cast by the spotlight of attention given to contemporary events in Korea, Japan and the beginnings of American involvement in Vietnam. 8 No Author, “Mission for Nixon.” The New York Times, February 10, 1957. 10 No Author, “Richard Nixon: America’s No. 2, He made a political asset of a liability”, The Ceylon Daily News, November 27, 1953, p.10. 12 “Report on Far East Trip, Remarks to the White House Conference of Mayors on National Security”, Richard Nixon Pre-Presidential Collection. Speech File, PPS208., 13:14, December 12, 1953, p.28-29. Richard Nixon Library and Birthplace Foundation, Yorba Linda, California. 15 “Symbolic Acts and Press Conference For Vice President Nixon,” Richard Nixon Pre-Presidential Collection. Series III: Trip Files, Sub Series A: 1953 Trip to Asia and the Far East. Declassified 16/6/97. Richard Nixon Library and Birthplace Foundation, Yorba Linda, California. 16 No Author, “America’s Part in Security”, The Times of London, August 18, 1953, p. 4. A Hartal is an Indian term for business stoppage or strike. 17 “America’s Part in Security”, The Times of London, August 18, 1953, p. 4. 18 No Author, “Curfew Retained in Ceylon”, The Times of London, August 15, 1953, p. 5. 20 “Confidential Pocket Summary”, Richard Nixon Pre-Presidential Collection, 1953. Declassified 16th June, 1997. Richard Nixon Library and Birthplace Foundation, Yorba Linda, California. 21 Curfew Retained in Ceylon”, The Times of London, August 15, 1953, p. 5. 22 Chang, Li, “Ceylon’s Trade with Communist China.” Far Eastern Survey, Vol. 22, No. 6, 1953, pp70 – 72, 72. 23 No Author, “Ceylon-China Trade Pacts, Mr. Senanayake’s Defence”, The Times of London, January 21, 1953, p. 7. 26 The Mutual Defense Assistance Control Act of 1951 passed Congress as a means of denying communist countries access to strategic goods originating in participating countries in the American continent, Europe and Asia. 32 No Author, “Ceylon Rubber for Peking, US Criticism”, The Times of London, January 19, 1953, p. 5. 34 “Radio and Television Report to the Nation on Far East Tour”, Richard Nixon Pre-Presidential Collection, Speech File PPS 208, 13:15, December 23, 1953, Richard Nixon Library and Birthplace Foundation, Yorba Linda, California. 39 No author, “Richard Nixon: America’s No. 2, He made a political asset of a liability”, The Ceylon Daily News, November, 1953, p.10. 40 “Report on Far East Trip, Remarks to the White House Conference of Mayors on National Security”, Richard Nixon Pre-Presidential Collection. Speech File, PPS208., 13:14, December 12, 1953, p.29. Richard Nixon Library and Birthplace Foundation, Yorba Linda, California. 45 1953. “Personal correspondence between Vice President Nixon and Prime Minister Kotelawala”, Pre-Presidential Papers of Richard M. Nixon. Series 320, December 8, 1953. Richard Nixon Library and Birthplace Foundation, Yorba Linda, California. 47 No author and title, Ceylon Daily News, November 30, 1953 front page. 49 Kotelawala, Sir John.. “General Correspondence”, Pre-Presidential Papers of Richard M. Nixon. Series 320. Personal correspondence between Prime Minister Sir John Kotelawala and Vice President Nixon, January 2, 1954. Richard Nixon Library and Birthplace Foundation, Yorba Linda, California. 50 Nixon, Patricia R, “Handwritten notes on itinerary”, Richard Nixon Pre-Presidential Collection, Patricia Ryan Nixon Papers, PPS 267, 1953 Trip File, Box No. 3. Richard Nixon Library and Birthplace Foundation, Yorba Linda, California. 51 de Silva, Irene, “Handwritten letter from Mrs Irene de Silva to Patricia Nixon”, Richard Nixon Pre-Presidential Collection. Patricia Ryan Nixon Papers. PPS 267, November 28, 1953, Trip File, Box No. 3. Richard Nixon Library and Birthplace Foundation, Yorba Linda, California. 52 Nixon, Richard M., “Memorandum from Richard Nixon to ‘Caraway, Herter, MacGregor and Watts”, Richard Nixon Pre-Presidential Collection. Series III: Trip Files, Sub Series A: 1953 Trip to Asia and the Far East (Series 364),October 18, 1953. Richard Nixon Library and Birthplace Foundation, Yorba Linda, California. 53 “Confidential Security Information”, Richard Nixon Pre-Presidential Collection, 1953, p.6. Richard Nixon Library and Birthplace Foundation, Yorba Linda, California. 56 Nixon, Patricia R, “Handwritten notes on itinerary”, Richard Nixon Pre-Presidential Collection, Patricia Ryan Nixon Papers, PPS 267, 1953 Trip File, Box No. 3. Richard Nixon Library and Birthplace Foundation, Yorba Linda, California. 57 Nixon, Richard M., “Memorandum from Richard Nixon to ‘Caraway, Herter, MacGregor and Watts”, Richard Nixon Pre-Presidential Collection. Series III: Trip Files, Sub Series A: 1953 Trip to Asia and the Far East (Series 364),October 18, 1953. Richard Nixon Library and Birthplace Foundation, Yorba Linda, California. 58 Nixon, Richard M., “Text of Vice President Nixon’s Radio Ceylon Address.”. Richard Nixon Pre-Presidential Collection. Series III: Trip Files. Sub Series A: 1953 Trip to Asia and the Far East (Series 370), November 28, 1953. Richard Nixon Library and Birthplace Foundation, Yorba Linda, California. 59 No author, “Richard Nixon: America’s No. 2, He made a political asset of a liability”, The Ceylon Daily News, November, 1953, p.10.